This winter/spring has been a rollercoaster for sure. The weather has been all over the place as well as the dirty water. I guess it was a dream to think it would be as incredible as it was last spring. Even with all of the wind and dirty water it still has been a very good spring. Of course some days leave you wondering what went wrong and others left you in shock that it was over that quick. 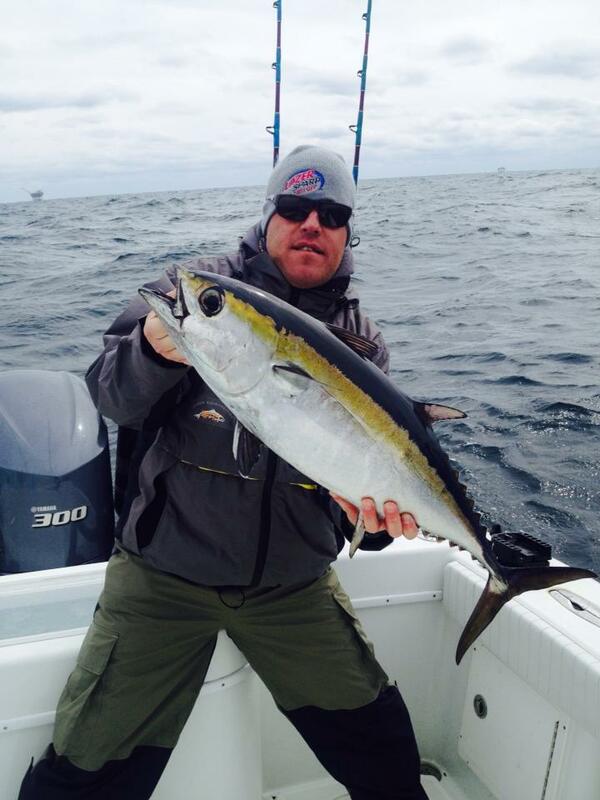 This year the blackfin have been the biggest player on most days. And with no rhyme or reason at the exact same place the following day the yellowfin steal the show. And in typical spring fashion there is a kicker yellowfin in the 60-80lb range on most trips just to keep it interesting. Along with a few wahoo that have gotten a little to clumsy and didn’t clip us off. I have been using the Eagle Claw Trokar TK 4 hooks in 4/0 through 7/0 with good success. I have kept 60 fluro on two rods and straight mono on two others and there has been no difference for me in the bite ratio. The one thing that has changed is that the poagies I was netting and live chumming went AWOL and were nowhere to be found. Thankfully the tinkers have showed up and have been willing players. They are small but fishable. And the best thing about them is they swim away from the boat and not into the props. On 3/28 I have the Breland group in along with their young boys. This trip was perfect with the boys catching thier share of blackfin along with a couple of yellows while live chumming with poagies. But for them the real thrill was the AJ’s that was the perfect way to cap the day off. It’s the best thing when you hand someone the rod and they ask what the bite will be like and the next thing you hear is either a long stream of rather explict language or a loud crack as the rod gets slammed to the gunnel. We kept our limit of jacks and all of the blackfin they wanted and had a great day. On 3/29 I ran a private boat and mother ocean threw a monkey wrench into our plans for the day. The aliens came and took all of the poagies away overnight. No worries the blackfin have been thick and jigging with 230 gram FC labo jigs has been almost a sure thing. We only wanted a couple to chum with but the first drop a wahoo in the 40lb range ate one. With a good fish in the boat right away the day was off to a good start. Now the blackfin are fired up on the jigs and enough was made for chunk bait. Since they didn’t want any blackfin to eat went pushed off offshore. This where it went downhill for us. We got offshore to find out we missed the bite because of the time we spent looking for poagies. So with our tail tucked between our legs we came back in. We hit a rig for Aj’s and it was pretty good the only problem was keeping the fish out of the rig with their jigging tackle. At least the day was looking up. We did manage to boat a couple of them for revenge. The next stop was for our snapper at the snapper factory. It went exactly as one would expect quick and easy as long as you didn’t put a bait below 15 feet. At least we ended on a very fun and high note with the ever willing red snapper. On 3/30 I had the Dykman group with the poagies gone we tried a little chumming but the current was wacky and all we were doing was spinning in circles. So I broke out the jigs and on the first drop was a nice blackfin that started fighting funny. We quickly found out why as a mako in the 350lb range skyrocketed on him and came completely out of the water. That was a cool sight but no video of it. With the current not working for us we just bounced around and fished jigs all day and put together a few small yellowfin a kicker one in the 70lb range and a bunch of blackfin. We also manged to box a couple of big beeliners on jigs as well. On 4/1 I had the Delany group in for what was susposed to be two days. But the weather got us on thier second day which was susposed to be on Wednesday. Monday started out in triple rediculious fog that stayed with us all the way out to about 18 miles offshore and lasted until about 10:30 or so. It was tough trying to wahoo fish by radar but it started off well with a few blackfin and AJ’s. But it quickly slowed down as the kingfish and jack cravelle’s took over and that was all that wanted to eat on the troll. We went to jigging and boated a solitary yellowfin and a handful of blackfin for the day. Not a great day by any means but the boys got the catch some nice fish and a first yellowfin so it wasn’t a total letdown. On 4/2 The Eubanks group got to experience some tough fishing for the first part of the day. But as the day wore on it got better and ended up well. The fog was much better although still pretty thick. The tinkers were a little on the tough side until I found out the exact sibiki they wanted after that it was easy pickings. After bait we ran and checked every rig that we had been fishing and had fish on them. With the radio traffic pretty gloomy we kept pushing on. At the last spot of the day and guys leaving from there with nothing or very little in there boxes. We tried it anyway right off the bat the tripled up on small yellowfin. About time it was 12:30 and nothing in the box. We stayed there for a little longer and picked up a couple of blackfin. When that small bite died we went a little farther north and finished the day picking away at the blackfin and beeliners fishing live tinkers on weights until they had enough. The weather had me at the dock until 4/6 but the forcast let me get the Stowers group out. This day just didn’t have the feel to it that it should have. There have been a few tough days but at least it was a slow pick of fish but this day it was just dead. All we could manage was one yellowfin a couple blackfin two beeliners and an AJ. Some days you’re the windshield other days you’re the bug. From what I gather there were a lot of bugs that day. Of well that’s what rum is for to drown the sorrows of slow fishing. On 4/7 the Denmark crew had a day as easy as it gets. It was a day that you couldn’t do anything wrong. We didn’t miss a yellowfin and only had one get away from us. 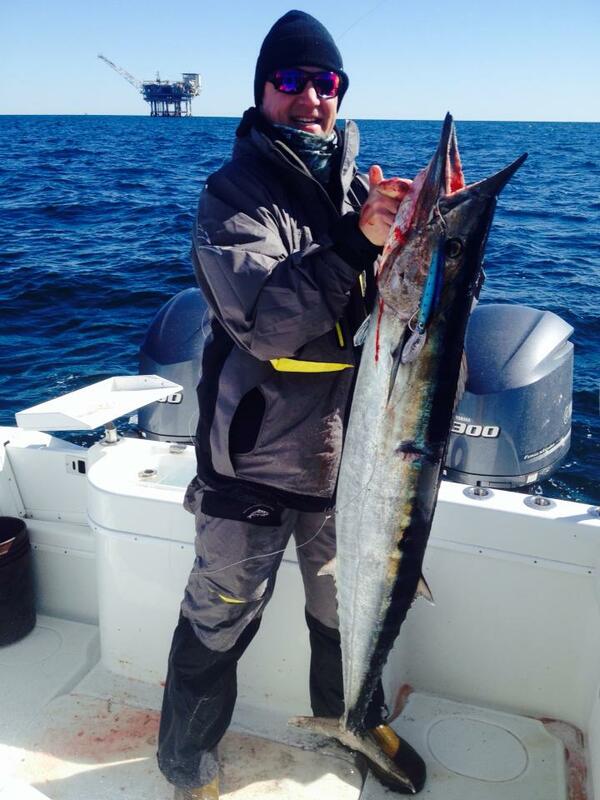 We had another susprise wahoo with the Trokar TK4 hook. I thought it was a white the way it ate slow and went for the surface. It was giving the Shimano Tranx reel a workout but we got him. The yellowfin wouldn’t let us get our line in the rigger clips before they were taking them. We ended up with a real nice box and hit the bait rig up for more bait and the best tuna fishing of the day. Everything we put into the water was eaten immediately with poppers and livebaits getting hammered ten feet from the boat. We ended the day on a high note and added another kicker fish of about 80lbs or so to the box. We threw the towel in around noon and headed to the house with happy anglers. I will be back at it as soon as this little blow passes and as we move into late spring and early summer it will only get better. Until next time catch ’em up. 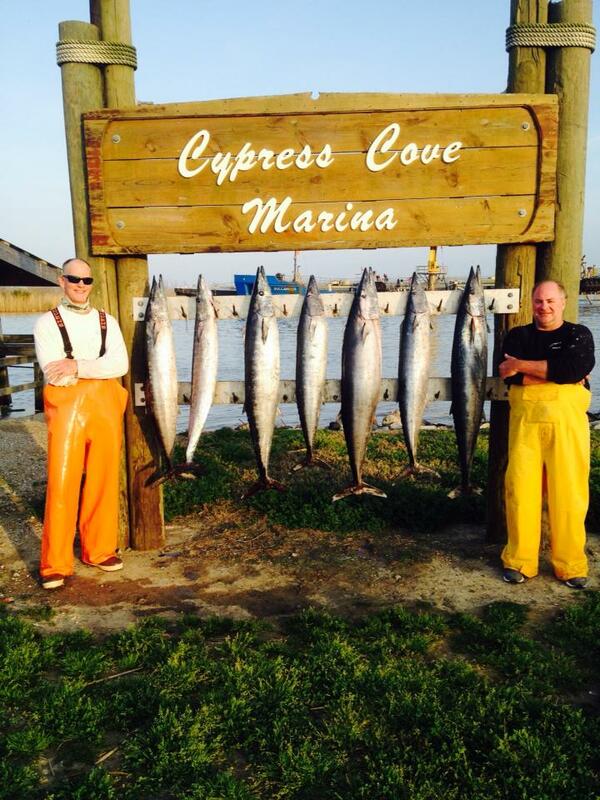 Here is a mid march fishing and best of all catching report. Thankfully there has been more catching going on rather than fishing. The weather has been a huge contributing factor lately with conditions from very rough to as smooth as a strippers nether regions. The lump has been our go to place up until a few days ago. For one reason it as just been to rough to go anywhere else. But the bite has been pretty decent, but with some up and downs in it. These up and downs did cause me to make a not wrong decision but I could of made a better decision for my group that came in from Pensacola. Thank goodness the wahoo bit ok along with a few blacks AJ’s and one lonely yellowfin that joined us for a ride back to Cypress Cove. But we did miss the best lump day of the season so far because of it. But at least we still made a good day out of it. From that trip I ran in early march the weather has caused me to cancel way more than I should have. The weather man did cost us a few trips with a forcast that was way off. I hate playing weather Russian Roulette. Unfortunately that’s just part of winter fishing. Enough of *****ing about the weather and on to the meat and potatoes of this report. I started off with last series of trips with David Markovich and his wife on Wednesday the 13th.. A yellowfin was on his bucket list and we set off to the lump to get it crossed off of his list. We did a little wahoo fishing on the way out in some not so favorable conditions but doable. I couldn’t find any that wanted to play with us. But we did find some AJ’s that were willing. Little did I know they were going to be almost non stop companions for us that day. After we got to the lump we couldn’t get away from them they ate chunks and jigs and of course our mullet. We did lose one yellow at the boat so at least David got to have the chance at one. It was a very enjoyable day of catching fish just not the target species we were looking for. David if you read this I will get you your yellowfin when you come back this summer that’s a promise. After the Markovich trip I had Flip Hubbard and his son Tad come in for two days. On the first day I was woke up around 4 AM with the camp shaking from the 25 knot winds. Great not a good way to start out the day. A call was made to meet at 8 and hope the weather guessers were right with it dropping as the day went on. We went out of South pass and went with the seas and did some wahoo fishing as we worked our way to the west and the lump. The wahoo were a no show although we did mark them but I couldn’t figure out the code to make them bite. We set a drift up at the lump and it was pretty steady with a blackfin here and there and of course the ever annoying kingfish and sharks. But Tad did get his first kingfish. Finally at the end of the day we got on a good bite of 60-80 pound yellows and put three in the boat and the call was made that they didn’t want to kill anymore. It was kind of a hard decision to make, keep fishing and catching them. Or head in with happy customers. They won out and we left in somewhat ok seas. The weather guessers did get it somewhat right. On the way in I saw some signs that I needed to see to change up my gameplan for the next day. On day two the seas were slick and with my poagie net onboard we set out to net poagie and live chum the lump. Well the kings loved that but with no current and everyone else around me looking bored we left and went looking. We found what we were looking for and went to work live chumming a mixture of yellowfin and blackfin. We had a few wahoo cutoffs as well. Remember the rig from the day before that they wouldn’t bite on well they wanted livebait. But they wouldn’t touch a livebait on wire. We did keep two yellows one we gave to another boat and one went to a cookout. We hit a little snapper spot on the way home to let them catch some since they have never caught one so we scratched that species off the bucket list. It was a great feeling knowing that cutting chum was over for the year now that the livebait has shown up. The Stephenson group was next up and with the slick day we had the day before and what the guessers were guessing. 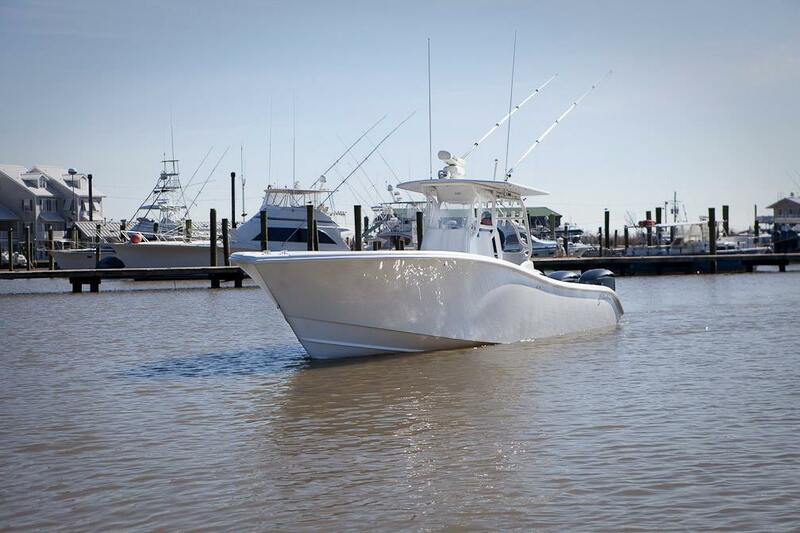 It was a susprise when we hit the gulf to find it pretty darn rough. But the tuna were right were we left them and we went to work putting a box of yellowfin and blackfin together. They get so excited and turned on by live chumming that its almost not fair to the fish. We only had two yellows a typical springtime 30 pounder and one in the 70 pound range. We also had a bonus catch of a 10 pound mangrove snapper that ate a bait meant for a tuna. With the group wanting to go hit up Bourbon Street we left early and got there fish cleaned so they could go and party. The next day with the Huelsman group was carbon copy of the day before except that there were more yellowfin than the day before they were the 20-30 pound models but they were very willing. The only thing different about this day was the front that came crashing down on us. Luckily we had our limit of yellowfin and a self imposed boat limit of blackfin and we left a little before 11 to head back to the marina. It was a good run of trips with plenty of fish to go home and happy clients. Until next time catch’em up.